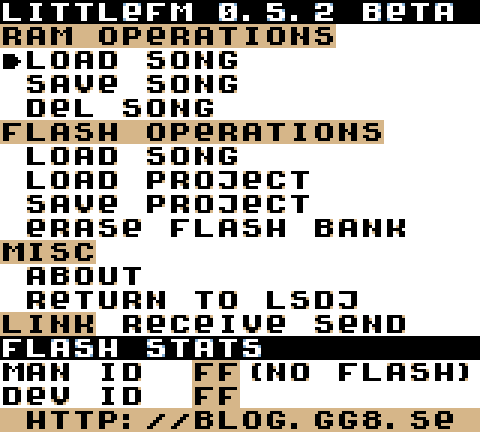 LittleFM is an alternative file manager for LSDj that lets you store 8 “projects” (savs) in flash memory. These can be saved and loaded just like you would save or load a sav file from/to your computer. It runs on the Gameboy, as a patch to a LSDj and shows a menu on startup. LittleFM comes with its own patcher, called ShitStrapOn. Originally, I created this program to add a bootstrap for starting Shitwave, which is the source of the name. ShitStrapOn requires Java and asks for a clean LSDj ROM and returns a patched ROM, ready to be written to a flash cartridge. If you’ve stored songs in flash and want to back them up to your computer, make sure to choose 2048 kB as the ROM size in the transfer program, or your song data won’t be backed up. On drag’n'derp, this should be handled automatically, and the file on the faked USB memory should appear as 2048 kB instead of 1024 kB after running LittleFM for the first time. LittleFM can use generic flashcarts based on the following flash chips: AM29F016, AM29F032b. This includes flash cartridges sold under names as Bleepbloop, Smartboy and Fighter Cart. It is also compatible with drag’n'derp. Backing up data to flash memory does not work on any EMS cartridge. This is a hardware limitation of those cartridges. While the program running on the Gameboy cannot access the flash chip on EMS carts, it has a hardware feature to allow multi ROM support. As a proof of concept, LittleFM 0.5.1 has integrated support for this EMS multi ROM capability. As this is a proof of concept, it does not come with a special patcher, it does not check that ROMs are correctly aligned and it doesn’t handle save data at all. However, to show that I paid attention at least slightly to detail, it does not show repeated entries when used in an emulator, and also gives you an error message if the switching failed, unlike most similar menus. Then burn out.gb as the only ROM onto your EMS cartridge, USB or non-USB. Press start to bring up the EMS multi ROM menu. LittleFM 0.5.2 - Fixes a bug where some files would incorrectly fail to load with the message “no blockjump”. LittleFM 0.5.1 - Provisional support for EMS multi ROM support. LittleFM 0.5 - First version with ShitStrapOn for patching the ROM. Drag’n'derp support. Sav trading over link cable. SRAM integrity checks to detect first time use and non-working RAM. LittleFM 0.4 - The first public version. Buggy. Came as an IPS patch that only worked with LSDj 4.0.5. If you found LittleFM to be useful, please consider making a small donation to encourage future updates. 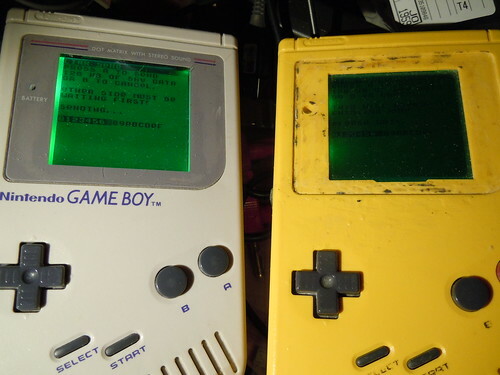 This page was previously hosted on http://gameboygenius.8bitcollective.com/wordpress/gameboy-resources/littlefm-an-alternative-file-manager-for-lsdj/ (*).